Every Tuesday night for the past 30 years I’ve walked back and forth on 11th Street going to and from choir rehearsal. I write about this walk in my book, and one of the things I describe is passing by 18 West 11th Street and watching the ever-changing costumes of the Paddington Bear in the window. David died in 1994, and Norma died on January 28th. I never met either of them, but I’ve taken a lot of pleasure in the ever-faifthful presence of this bear, and it breaks my heart to think that this is the last time we will ever see him. Thank you David and Norma Langworthy for such a sweet contribution to the life of New York City and our wonderful West Village. I hope you both had fantastic lives. You made mine better. I live across the street and enjoyed seeing the bear and his many costumes each day. They included Mets and Yankee uniforms at the start of baseball season, Halloween costumes at the end of October, and many other holiday appropriate outfits. 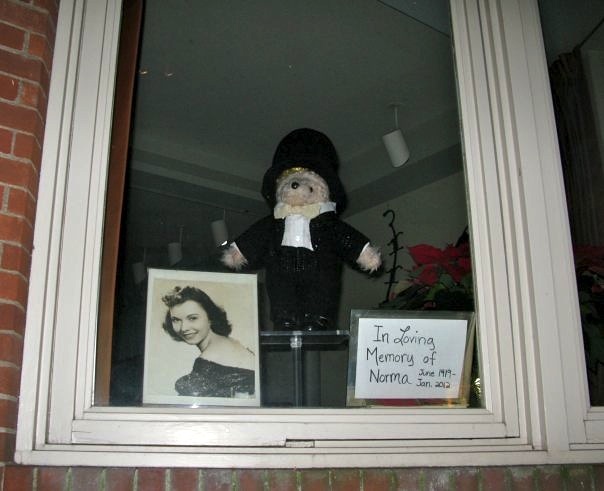 I had the pleasure of meeting Norma once, walking home from the subway after the Opera. So I know she was an opera fan, and was very pleasant to speak with. The block just won’t be the same. 93 years. A long life. Hi, thank you so much for stopping by and sharing! Yeah, 93 is a good, long life. But still.